We are actively working with the concept of “Partnership Manufacturing”, ensuring that we can continue to be an attractive partner for our customers, employees and suppliers. This means that we focus on being a sparring partner regarding your process and product design. Together, we can optimise the entire value chain and improve your product and profit. You will benefit from our experience, knowledge of steel and skills beyond the production itself, as we are your partner throughout the value chain. We can handle prototyping, planning, material procurement, production, assembly, further development, quality assurance, packaging and logistics – a process that can benefit price and quality, your customers and ultimately your business. We also handle all facets of the job with great attention to detail – from edge bending to welding and delivery. We are happy to meet your individual design needs. For example, we can mount and surface treat components in collaboration with some of Denmark’s best surface treatment experts. We also offer storage and delivery directly to your customer or as parts for your finished product. As project managers, we ensure that all processes are carried out optimally and that the product is delivered on time. As a customer, you only have one contact person who will oversee the project throughout the entire process. We have delivered solutions for many different products from furniture to industrial products. We believe that it can be put very simply: “integrity” is one of our most important values. Hosta Industries works with all facets of task solution, and in our collaboration with you as a customer, integrity and proper conduct are cornerstones. We want to be your manufacturing partner and work with you to develop and optimise your product. Our starting point is a strong, healthy culture, and all our employees are fully aware of the importance integrity has in your world. You can rely on us being true to our word, always providing you with service, quality and delivery to match your expectations. Your task will be followed through by fixed contact persons who know your company’s needs – we believe this is service with integrity. Hosta Industries must be a centre of excellence for steel, where we optimise the value chain for our customers and improve their product and profits. We are dedicated to the concept of Partnership Manufacturing. This ensures that we are our customers’ preferred supplier of complex steel processing with additional processes and services. We want to be a professional and attractive partner throughout the process; from concept and design to finished, delivered product, creating value through our expertise, technology and capacity. All our employees are fully aware of the significance of integrity – namely that both customers and employees can rely on us being true to our word, always providing a service, quality and delivery which matches customer expectations. We want to be an attractive workplace with a healthy culture, where there is room for everyone. As a company, we know that we are stronger together. 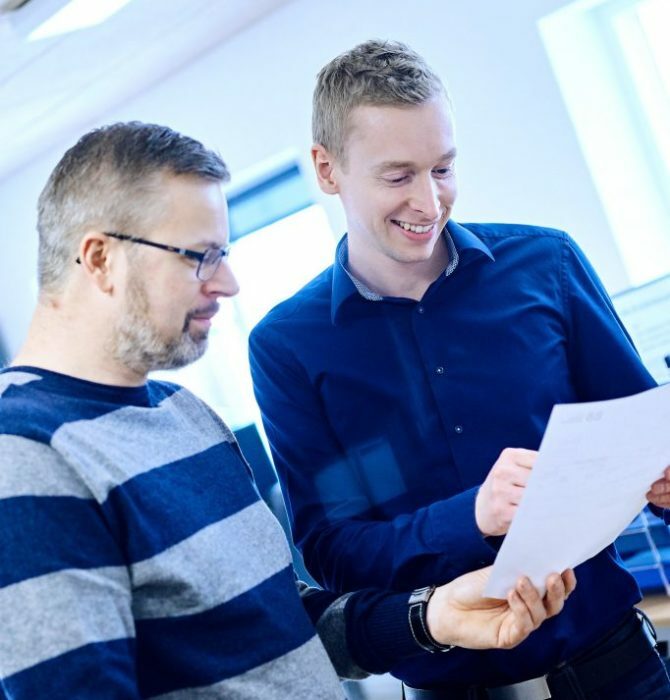 Internally, we share our knowledge in teams, across the company in our day-to-day work and we enter into partnerships that optimise our customers’ processes. Using our knowledge to develop ourselves and our customers is important. At Hosta Industries, we have a strong drive. Our driving force strives to provide the best quality and stay ahead in our field – to our customers’ advantage. We set ambitious goals and are willing to make an extra effort to continually develop. Hosta Industries was established in 1973 by Orla Mosevang, and since then it has remained a leading supplier to the metal industry in Denmark and abroad. We believe that our stable and positive development stems from our customers’ trust and our unwavering commitment to creating value for our customers. From a modest start in premises of 130 m2, Hosta Industries now have over 15,000 m2 of production facilities in the industrial area in Hjallerup in North Jutland, employing approx. 90 employees. The company is currently owned and run by Christian and Søren Mosevang. From the beginning, Hosta Industries has been undergoing a stable and positive development, and today stands as a modern and prosperous company. Hosta Industries A/S will be closed for the summer holidays during week 29, 30 and 31. From the beginning in 1973, Hosta Industries has strived to deliver the best possible product to the customer. As a tool for method management in relation to achieving the best quality, in 1993 we introduced the ISO 9001 quality management system, which has been implemented throughout the company today. This permeates the entire company, where all employees will always do their best to deliver the excellent quality for which Hosta Industries has become known. Demonstrating responsibility towards the local community, the environment and people is a fundamental part of Hosta Industries. We do this by working with social, environmental and employee-related areas, where we can connect the business to social responsibility. We do this partly by our work with sustainability: we take social responsibility in the form of cooperation with local authorities and other agencies working with vulnerable groups, and we are involved in local associations as well as in various charitable initiatives.